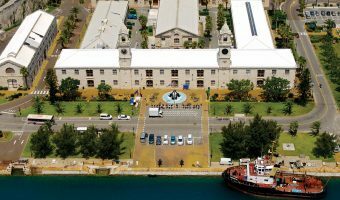 This restaurant is one of a handful of places to eat at the Royal Naval Dockyard, one of the major tourist areas in Bermuda and the main cruise ship port. As the name suggests the menu has a strong emphasis on seafood. Prices are reasonable for Bermuda. To begin with try the Conch Fritters or Fresh Mussels. Entrees include Fish and Chips and Deep Fried Shrimp. Pastas, curry dishes, and pizzas are also available. Patrons can dine inside or out. The Freeport Seafood Restaurant is situated next to the entrance to Dockyard, close to the Clocktower Mall. It’s open daily for lunch and dinner. A take-out service is also available. Map showing location of Freeport Seafood Restaurant.